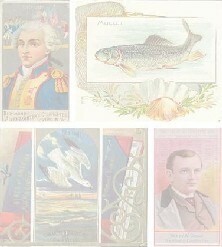 Categories > 1901-1930 > Any T 107 Helmar Seals of the U.S. and Coats of Arms of all Countries of the World Cards for sale out there? Picked up several of these now. I made a spreadsheet on Google Sheets to show what I need. Not super sensitive on condition as long as they present fairly well. Please let me know if you have any available. Added a link to my Google Sheets spreadsheet which shows what I now need. Got a few incoming since my initial post. Still working on this set. My link above is updated. Send me your address and i can drop them in the mail for you! Thanks to Marslife I checked a few more off the list. Still looking for the others I need. I have ten of them. Send me your address at edhans@monkberry.com. Just saw this message sent you an email. I've been away for a bit from the forum.